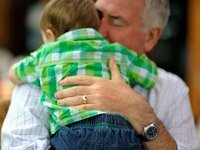 How Do I Move From Surrogate Dad to Granddad? Focus on what's best for your grandson. The more you support and respect his parents and their progress, the more they'll be willing share their son's time. Make sure they know you're happy for them and will always be there: Having stable, responsible parents is what your grandson needs most. Also, focus on your own hobbies and personal development so you can enrich your life and your grandson's life. You've given your son and grandson the ultimate gift: a loving foundation. Don't forget that. I've been raising my grandson for six years now, with no help from his parents. My other son and his wife have two daughters, and I enjoy being a more conventional grandparent to them. I can understand your sadness over "losing" your grandson, but you'll still be a big part of his life — just in a more fun, less stressful way. You'll be there no matter what happens, and I'm sure he'll enjoy your visits, your babysitting, and your involvement. After my grandson lived with me for several months, he briefly moved in with his mother — my daughter — and I felt the same way you do. (My grandson is now with me permanently.) This separation can make your relationship with your grandson richer. I wish you luck with this transition: I hope you rediscover the joy of being a grandparent. The Wisdom Circle was right: I survived the separation much better than I expected to. The silence at home was a pleasant surprise — I'd forgotten what that was like. I observed two years of drama with my son and his girlfriend, but now things are calmer, and I still get to see my grandson often.